You're hallucinating, and you know it... Time is messed up. First it seems slowed, then it seems to be speeding up... Even more noticeably, when you look at your body, it seems to be morphing. You're getting smaller... Minutes later, you're growing larger and larger. That's a description of "Alice in Wonderland" syndrome, a rare form of Migraine aura. The most distinctive symptom of "Alice in Wonderland" syndrome is this type of metamorphosia, a distortion of body image and perspective, which Migraineurs know is not real. "Alice in Wonderland" syndrome can occur at any age, but is more commonly experienced by children. 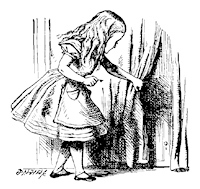 "Alice in Wonderland" syndrome was first described by C. W. Lippman in 1952. J. Todd actually named this aura "Alice in Wonderland" syndrome in his 1955 article, "The syndrome of Alice in Wonderland," in the Canadian Medical Association Journal. He named it for Lewis Carroll's "Alice in Wonderland" and "Through the Looking Glass and What Alice Found There." Carroll is know to have been a Migraineur, and it's thought that much of the imagery for these writings may have been inspired by his own Migraine auras. "I must be shutting up like a telescope. And so it was indeed: She was now only 10 inches high ... " Later, she eats a piece of cake that makes her grow: 'Curiouser and couriouser,' cried Alice. 'Now I am opening out like the largest telescope that every was! Goodbye feet! '(For when she looked down at her feet they seemed to be almost out of sight they were getting so far off.)" If you experience any of these symptoms, be sure to talk to your doctor to ensure that they are part of your Migraine. Evans, Randolph W.; Mathew, Ninan T. "Handbook of Headache," Second Edition. Lippincott Williams & Wilkins. 2005. Young, William B., M.D. ; Silberstein, Stephen D., M.D. "Migraine and Other Headaches." American Academy of Neurology Press. 2004.